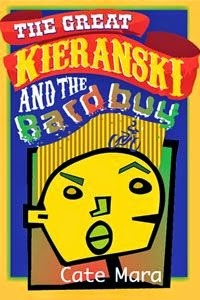 Cate Mara's "The Great Kieranski and the Bardbuy" is a story about a charismatic boy named Great Kieranski who is determined to have an adventure on his last day of summer vacation. Kieranski and his crew, his group of friends, decide to get to the bottom of the mystery surrounding the enigmatic monster called a Bardbury. Their adventure results in all kinds of excitement, from encounters with a bully to amateur sword making. This is a story of friendship, and the reader really gets a feel for the camaraderie of the boys. The dialogue is true-to-life for the age group, and there are a number of funny parts that young readers will enjoy, such as a dog that is notorious for eating butter. The writing is perfect for the middle-grade audience, and readers in the age group will not have difficulty reading through the book. Overall, this is a great book for kids 9 to 13, depending on reading level, and those with an adventurous streak will enjoy it the most.